A brother and sister as well as another man are on trial accused of murdering Gareth Hutch (36). 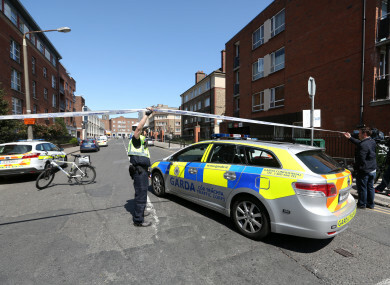 Gardaí at the scene of the shooting of Gareth Hutch in 2016. CCTV FOOTAGE OF the fatal shooting of a man as he was getting into his car outside Avondale House flats in Dublin over two years ago has been shown at the Special Criminal Court. The three-judge, non-jury court saw footage today of two men shoot a man dead in the carpark of Avondale House flats on North Cumberland Street in Dublin on the morning of 24 May, 2016. A brother and sister as well as another man are on trial accused of murdering Gareth Hutch (36), nephew of Gerry “The Monk Hutch”. Thomas Fox (31) with an address at Rutland Court, Dublin 1, Regina Keogh (41) from Avondale House, Cumberland Street North, Dublin 1 and Jonathan Keogh (32) of Gloucester Place, Dublin 1, have pleaded not guilty to murdering Hutch. Fox has also denied unlawfully possessing a Makarov 9mm handgun on 23 May, 2016 at the same place. Giving evidence today, Garda Catherine McAteer from Mountjoy Garda Station, said that she obtained permission from the area manager of Avondale House to access and download CCTV footage in relation to the murder of Gareth Hutch. The court then viewed CCTV footage of the movements of certain individuals on the morning of 24 May. Paul Burns SC, prosecuting, said that a man in black clothing can be seen walking past the front gate of Avondale House followed by a man in a grey top at 6.46am on the morning. Footage was also shown of these two men moving quickly towards the stairwell of Avondale House at 6.47am. The second man was carrying a plastic bag, the court heard. The two men emerge on the first floor of the complex, the court saw, and go in the direction of a flat on the first floor. At 9.53am, another man can be seen emerging from Block A with a newspaper in his hand and walking towards a black car. Burns said this man can be seen opening up the back door of the car, taking off his black jacket and putting it into the back seat of the car. As he opens the front door of his vehicle, two men can be seen emerging from the direction of Block A and approaching this man “very quickly”. Describing the footage, Burns said these two men appear to have “pointed objects” towards the man at his car. Burns said the man then appears to fall onto the ground. The window from the driver’s door of the car has been shattered, he added. Counsel said one of the two men then appears “to throw something away” as he runs from right to left. The two men go over to a dark vehicle which is parked next to a white van in the carpark and get into it. At this moment, the court also saw footage of a silver vehicle enter the complex and pull up to where where the man was lying on the ground. “Someone gets out of the silver vehicle and runs towards the man who fell,” said Burns. The two men who had previously gone over to the dark vehicle are seen in the footage running towards the front gate of Avondale House flats. The man who arrived in the silver car is then seen at the gate and begins to run in their direction. The court heard yesterday that Ross Hutch arrived on the scene after the alleged murder, saw Gareth on the ground and followed the two attackers for a while before turning back. Burns said previously that the two attackers ran in the direction of Sean McDermott Street before they got into a silver Skoda Octavia, which was parked on Champions Avenue. It was during the opening of the trial that the prosecuting barrister told the court that the killing of Hutch was not a spontaneous or spur of the moment act but a “brutal and callous murder”. “It was premeditated and a significant amount of planning had gone into it,” said Burns. The prosecution say the three co-accused each had their own part to play in bringing about the death of Hutch. Keogh was one of the two gunmen, together with another man, who directed the attack which killed Hutch. Both he and Fox were “instrumental” in the planning and carrying out of the attack, the court has heard. The prosecution contend that the evidence of Mary McDonnell, who had a flat at Avondale House, is “important” in this trial, as the three accused had gathered in her home in the hours before the murder. Her kitchen window had a view into Hutch’s flat. It is the prosecution’s case that five vehicles were involved in this shooting, and DNA and fingerprint evidence link Keogh and Fox to these vehicles. Email “Court shown CCTV footage of two people shoot a man dead in Gareth Hutch murder trial”. Feedback on “Court shown CCTV footage of two people shoot a man dead in Gareth Hutch murder trial”.